Indian food is really full of flavors,aroma, as well of beautiful colors. Don't get intimidated to try and cook Indian food, be adventurous, you can either make your own curry by combining the correct spices to your taste or buy a good brand, my favorite is the one they sale at Costco. (Sometimes I add more cumin or ground fennel seed, it all depend on what I am cooking, some other times is coriander or the turmeric, etc). I was showed how to make this recipe by a coworker/chef, he was a really good cook, nice and a happy camper in a way. Never jealous of showing HOW, many cooks I knock with, were always afraid of showing, he was not. I believe it was year 2008 during the time I work while doing an internship for my Culinary Certificate. Like I always said, every dish we learn will go along with who showed it to you !, I went with some good friends to the Bombay House and I feel happy to say that the food was yummy, I got to try real Indian Cuisine for the first time, finally i could compare mine to the real thing, and happily I can tell you that mine was good, too. The picture is from last week, I showed my friend Nusset, how to make it because her family loves to go eat Chicken Curry. Thanks Nusset for letting me into your home ! 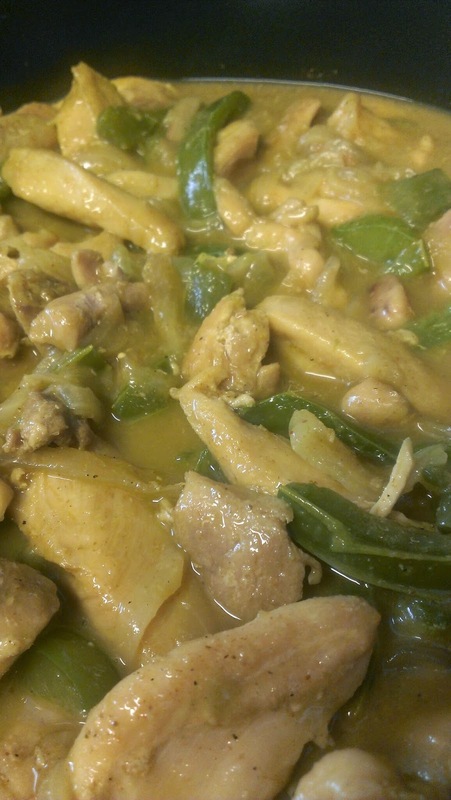 Here is the Chicken in Coconut Curry Sauce ! share it with friends. 2. To the same pan, add a bit more of oil and add the onions, sauté them a bit, until they starts changing their color. Immediately add the peppers and keep sauteing for a minute or two. Add the garlic and stir to incorporate. 3. Add the coconut and 2 cups of water or stock, also the curry, cumin and cayenne. Mix all ingredients well and cook on boiling for a few minutes, calculating that chicken gets cook. 4. Thicken with the corn starch. Add 1 tblsp of butter (optional) for a satin finish. 5. Eat over jasmine rice and naan bread.